7.71 points at 17 votes (rank 149). Robert Stack was the first actor of the fearless and above all "incorrupt" officer, which took on the organised crime in Chicago. In 1987/88 a blockbuster was produced in the Universal studios, in which Kevin Costner took over the role of Ness and chased Al Capone (Robert de Niro) together with Jimmy Malone (Sean Connery). Ocean Software only took excerpts from the movie for a game in 1989. You lead Eliot Ness's special unit on the search for Al Capone in the fight against organised crime in the Chicago of 1931 on different scenes during the time of Prohibition. The game is divided into six game sections which are based on scenes in the film with the same name. The graphics go from horizontal scrolling-screen shooter in level 1 over a view from the bird's perspective in level 4 to a pseudo 3D display in level 6. 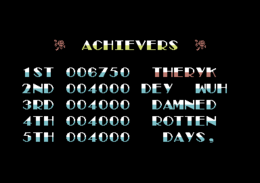 Each of the six levels is played in a different way. Displays from left to right: points, time left, collected evidence, energy, additional weapons, arrow for directions. This level reminds a bit of Batman - The Movie. Here you need to fight your way through a storehouse full of smuggled schnaps. The aim is, to collect evidence (each 10%) from Al Capone's accountants. The way to each accountant is shown by the diretion into which the arrow at the upper right points. The accountants are coloured in white and usually need to be hit four times before they drop evidence. It is recommended to shoot at the backs of the accountants with permanent fire. The document that he loses can be picked up by walking over it. 10 documents need to be collected. By shooting the other enemies, the player can get special items as better fire power (violin case), energy (rose) and time (hourglass). Displays from left to right: Four Untouchables (the active one is marked in white), score, time left, telescope. In the storehouse you have received the information that smugglers want to bring alcohol over the border between the USA and Canada. These need to be "eliminated". In this level you have three more men. It is recommended to swap the men often in level 2 and 3. The players moves rolling on the ground. Here enemies (about 25) are "eliminated" over a telescope. If you move the Untouchable to the fartest right or left out of the screen, you can choose other men. The chosen character is marked in white. By pressing the fire button you switch back to the game area. Displays from left to right: Four Untouchables (the active one is marked in white), score, time left, ammunition display. After a hint from one of the men at the border you go on your way to the station, where one of Al Capones accountants wants to leave the state. You have to find him (and the evidence) before the train leaves. Capone's men hear about your intentions and will try everything to hinder the Untouchables in fulfulling their task. On the way through the strees of Chicago to the station you have to reckon with an ambush at each corner (approx. 20). To change the active Untouchable or to reload the gun you need to move to the right behind the corner of the wall. After pressing the fire button the gun is reloaded, with joystick left you leave the cover. The level reminds of the game Cabal. 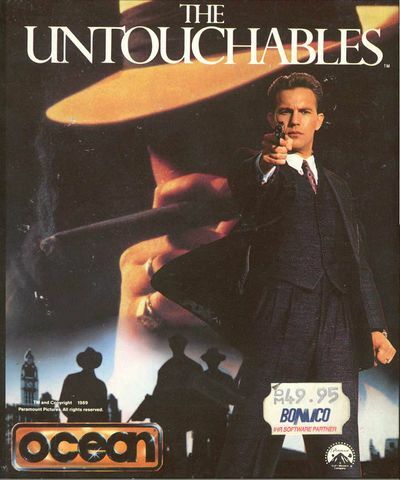 The second Untouchable (from left) is allowed to die, to be able to finish the level. Displays from left to right: energy display for Ness, time and energy display for the child. This level is supposed to show the famous showdown scene at the station. While Ness is waiting for the arrival of the accountant, he helps a woman to carry her pushchair up the stairs to the platform. Before he arrives on the top, Capone's accountant and his bodyguards enter, who immediately open fire. Ness unclasps the pushchair and shoots back. You have to help Ness to get the pushchair down safely through the hostile fire and destroy the attackers, but you are not allowed the endanger uninvolved passengers. Al Capone's accountant is taken hostage. Within five seconds you as Georg Stone (a professional sniper) have to shoot the gangster that hides behind the hostage and shows himself without cover only for a short time. If you do not make scene 5, you start again in scene 4. Now that all evidence is at hand, Capone is arrested. Only his confidant Frank Nitty is still a free man. You have to chase him over the roof of the court building and take revenge for Malone's death. Nitty can only be forced to retreat if you hit him while he changes his position from left to right or vice versa. This is the last gunfight, during which Nitty drops to death if you are successful. You get points for each shot gangster. A finished section gets you bonus points. Your energy supply is shown by the cartoon of the Untouchables. With sinking energy the display changes more and more to Capone. If an Untouchable dies, Capone with a baseball bat is shown at this place. Quickly switch between the Untouchables when the energy decreases. The energy of inactive persons is regenerated. 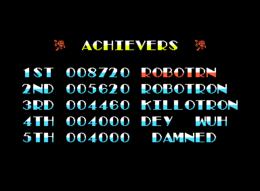 The version by remember offers next to different cheat modes also a saveable highscore liste and some fixes, e.g. no restart of the game is needed after finishing it. 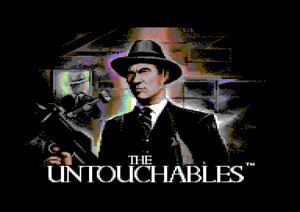 H.T.W: "Six scenes from the movie with the name "The Untouchables" from horizontal scrolling screen shooter in level 1 over the birds view perspective in level 4 to the pseudo 3D display in level 6 with relatively nice graphics and intermediate images. One might also like the music. 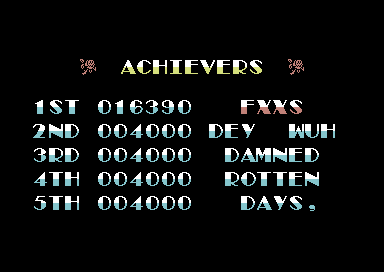 The game is partially well playable, but is for me in some sections a bit too difficult. Only for people with good reflexes... and such shooters and not really my cup of tea, therefore this is only an opinion not really criticism...". TheRyk: "The contemporary positive press reception is still a mystery to me. Vast parts of the game look as if Ocean recycled as much as possible of Batman the Movie and other games. However, the result is pretty much unplayable. Title music and jingles are a perfect match for the setting of the game, but this ingame saloon piano jingling is just unnerving and at least half a century anachronistic. Even if this cheery jingle-jangle was meant to be Charleston style, it's just bad. The single games (of which I wouldn't have seen more than one without trainers) are altogether fiddly patchwork, mostly copied from other games. For example the idea of different falling height causing a different amount of damage is from Batman - who at least has his Batterang rope. Here it's just a bad joke that one single collision can make you fall into eternal death (you only have one life in this game). Though some of the graphics and the title sequence are very pretty, I wouldn't touch this game with a ten-foot pole and rate The Unplayables 2 out of 10." FXXS: "The piano jingling is Ragtime, funnily it partially corresponds to the soundtrack for "the Clou", which also plays in the thirties of the twentieth century, but not at all to the soundtrack of the converted movie... Ragtime has also nothing to do with Western, it was composed when The West was not really "wild" any more, although it is also Scott Joplin playing in "West Bank". But let's go to the game itself and this is nice to look at with level 1, but as soon as you earnestly try to pursue the accountants you are quickly unnerved by their "AI" and in general by the unlimited supply of opponents from the "nothingness". 7 points"